The new EU president, Herman van Rompuy, will host an EU summit in an old library in Brussels next week - a first for the 107-year-old building. Mr Van Rompuy's deputy spokesman, Jesus Carmona, told the BBC the wood-panelled library in Leopold Park would create a "warm, intimate atmosphere". "The aim is to have a brainstorming discussion, an open, frank debate about the economy, climate change and Haiti." Normally EU summits are held at a big, modern building - closer to the media. The glass-and-steel Justus Lipsius building, where the leaders' delegations will remain along with the hundreds of journalists who normally gather there to cover EU summits, is a short walk away from the old library, called Bibliotheque Solvay. Each leader would have just one adviser at the library, sitting in an adjacent room, Mr Carmona said. The interpreters will sit on the upper level of the room where the leaders meet. As President of the European Council, Mr Van Rompuy will be chairing his first EU summit, alongside Spain's Prime Minister Jose Luis Rodriguez Zapatero, who currently holds the EU's rotating six-month presidency. 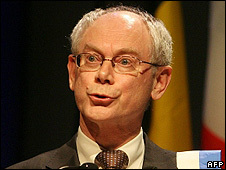 Mr Van Rompuy, a former Belgian prime minister, is the first holder of the new presidency job created by the Lisbon Treaty. Last month he said the informal 11 February summit would examine Europe's recovery from the economic crisis and plans for "growth to ensure that the foundations of our social model are consolidated - the European way of life". On climate change, he voiced disappointment with the outcome of the December global summit in Copenhagen, where the EU failed to win binding pledges to match its own target of a 20% cut in carbon dioxide emissions by 2020. "I am the first to admit that we, as the EU, would have liked to have gone further," he said. "It sometimes feels that our efforts in environmental matters are taken for granted and others take advantage of our constructive approach. I would like the union to have an influence on future negotiations and its position to be listened to and respected."